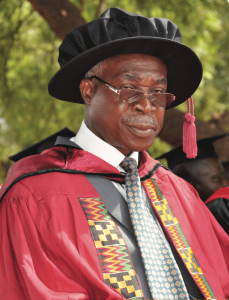 The Bishop, Dr. Douglas A. Boateng, is the founding Chancellor of the Knutsford University College. The Chancellor of Knutsford is the Head of the University College and he assumes the Chairmanship of any congregation and/or meeting of the Knutsford Community. The Bishop, Dr. D. A. Boating is a distinguished self-developed person, Entrepreneur and a Businessman in Africa. He built the Continental Christian Traders (CCT); a company which started as a small family business in October, 1990, from a one-small shop into a consortium of Companies with 8 subsidiaries. Currently, CCT is present in six African countries namely, Ghana, Togo, Senegal, The Gambia, Equatorial Guinea, Mauritania and counting. Dr. Boateng also serves as a Bishop of the Churches of Christ in Ghana. He has served in this realm for over 20 years and he is actively involved in planting new churches in Africa. He established Continental Mission Network (CMN) in 2015 to ensure that all the unreached parts of Africa is accessed by the Gospel of the Lord Jesus Christ which provides eternal salvation for all. In 2015, Obong University in Federal Republic of Nigeria, in recognition of his immense contribution to business and missions in Africa honoured him with a doctoral degree in Management and Leadership. Currently, he serves as the Chairman and the CEO of CCT Group of Companies.